We are now under two weeks away from WrestleMania 35, and WWE has confirmed it’s top two single’s World Title matches, and a RAW Women’s championship match with historical significance. In the history of professional wrestling, storylines have set the stage for mega-event payoffs for the fans, and it looks like the 35th edition of World Wrestling Entertainment’s biggest show is possibly ready to payoff three times in one night. Firstly, we have arguably WWE’s biggest current star, Becky Lynch. The woman who calls herself “the Man” to signify her strength and will, has set the WWE Universe a blaze since the hottest night of the Summer at SummerSlam 2018. From the moment she decided Charlotte Flair, nor anyone one else in WWE would stand in her way, the “Lass Kicker” has had an amazing run. Even when she was set to headline Survivor Series this past Thanksgiving weekend and was medically unable to compete due to Nia Jax’s reckless right hand, Becky still was on top of her game and it became clear that she would take this momentum with her as she and WWE RAW Women’s champion Ronda Rousey have been on a collision course. Though she lost her SmackDown Live Women’s title in the 1st ever women’s TLC main event in December to Asuka, she stayed the course, stuck to her principals and eventually won the 2019 Women’s Royal Rumble in thrilling fashion. Finally we would see Ronda vs. Becky, or would we? WWE chairman (in very unpopular fashion) suspended and replaced her with Charlotte Flair. Thankfully, due to popular demand, the suspension was lifted and Becky would win her way back into what would now be a triple threat match at WrestleMania. To add to the brightness of this match, it was officially made the first ever Women’s main event at WrestleMania in history and just last night (as of this writing), Charlotte won the Smackdown Women’s title from Asuka a match that wasn’t previously announced and a result no one saw coming. 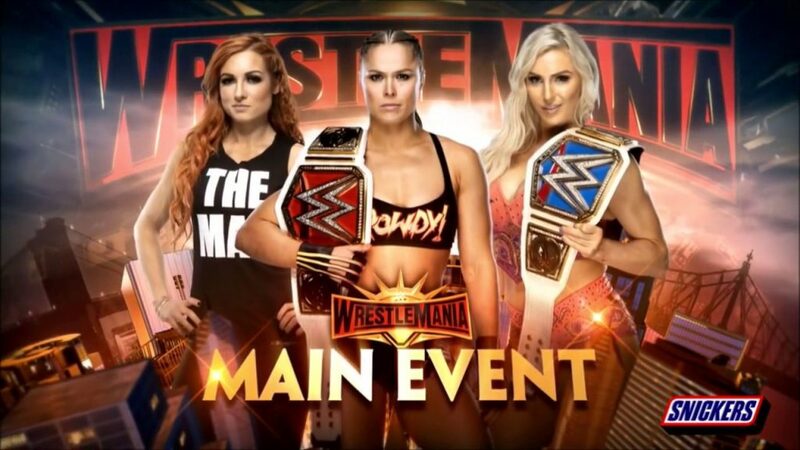 This has set the stage for what is sure to be Becky Lynch’s crowning moment, as the entire world will watch her compete in the greatest female triple threat match ever, in the main event of WrestleMania. Anything less than Becky Lynch walking out as RAW Women’s champion or even the unified women’s champion (with another week of WWE television before WM35, it is unclear if the SD Women’s title will also be on the line), would be unacceptable. With amazing momentum on her side, Becky Lynch’s fans all over the world hope this almost year long journey will culminate at WrestleMania XXXV with a championship victory over the RAW and SMACKDOWN LIVE women’s titleholders. Another feel good story with the potential to have a storybook ending is that of 11-year WWE veteran, and most deserving Kofi Kingston. This WWE triple crown winner has basically done it all in WWE winning multiple Intercontinental, United States, and Tag Team Championships, but in many ways, sadly was always overlooked as a possible world championship contender. That is until destiny became reality on a recent edition of Smackdown Live. The ultra talented Mustafa Ali was set to take part in the 2019 Elimination Chamber for the WWE Championship but was sadly injured two weeks before his opportunity. Going into the week of the pay-per-view on SD Live, there was a gauntlet match that took place to decide would would enter the chamber last. On that night, Kofi (who took the place of Ali after he was medically unable to compete) put on, what this writer feels was a Hall of Fame performance, lasting over one hour and putting the world on notice that he was ready for his crowning moment. The fans knew what they wanted, and the world was ready for Kofi to earn his much deserved first world title. After a great performance, Kingston would fall just short of achieving his dream in the chamber, but was soon put into a WWE title match at Fastlane by Shane McMahon. This would not come to pass however, as Vince McMahon overruled his son’s decision and replaced Kofi with the retuning Kevin Owens. Everyone in the locker room (including Owens himself) and all the fans wanted Kofi to succeed and though Vince threw every obstacle in the 11-year star’s path, Kofi finally got his ticket to Wrestlemania 35’s co-main event as the WWE Championship challenger with the help of his New Day partners/brothers Big E and Xavier Woods. Now, wrestling fans all over the world will be on the edge of their seats to see if Kofi Kingston takes his rightful place in history as a grand slam winner and world champion at WWE’s biggest stage, WrestleMania. Ironically, Kofi will challenge a man who calls him a “B+ player”, Daniel Bryan, the same man who was called the very same thing is his quest for WWE championship glory just 5 years ago. With the entire wrestling world cheering them on, the New Day helped their brother Kofi Kingston earn his rightful spot in the WWE championship match at WrestleMania after a tremendous gauntlet match victory. Following the match, WWE Chairman Vince McMahon finally confirms the eleven-year superstar would get his opportunity at the title on the grandest stage of them all, April 7th at MetLife Stadium. Lastly, we have ‘the Architect’, ‘the King-slayer’, and what many fans hope will be ‘beast-slayer’, Seth Rollins. After a great 2018 as an Intercontinental and Tag Team Champion, the man who was the leader of the Shield, former multiple time WWE World Champion, and undeniable fan favorite will go 1 on 1 with Universal Heavyweight Champion Brock Lesnar at WrestleMania. His men’s Royal Rumble win this past January was a heroic performance and would lead to a decision of which champion he would challenge at WrestleMania. The following evening on RAW Seth challenged Lesnar by attacking him courageously, but his offense against the champion was cut off quickly as he was given six F-5’s reminding everyone who the favorite would be in this upcoming Universal championship match. That withstanding, Seth has proven he is ready for the biggest challenge of his career, maintaining he will “burn suplex city to the ground”. So, now that the Universal title match at WrestleMania is set, the questions are: Will WWE fan’s see Seth do what many have not been able to do in defeating the most intimidating champion is recent WWE memory, Brock Lesnar? Or will Lesnar’s part-time yet dominating reign as champion continue? Most wrestling fans hope Rollins comes out of the Show of Shows victorious, but overcoming Lesnar in a world title match environment is a lot easier said than done. Seth Rollins’ choice to face Brock Lesnar for the WWE Universal title was courageous, but seemed like a shaky one when he recieved six F-5’s on RAW the night after he won the 2019 Men’s Royal Rumble.